This app came about after I read this meta thread feature request by Evan Carroll. 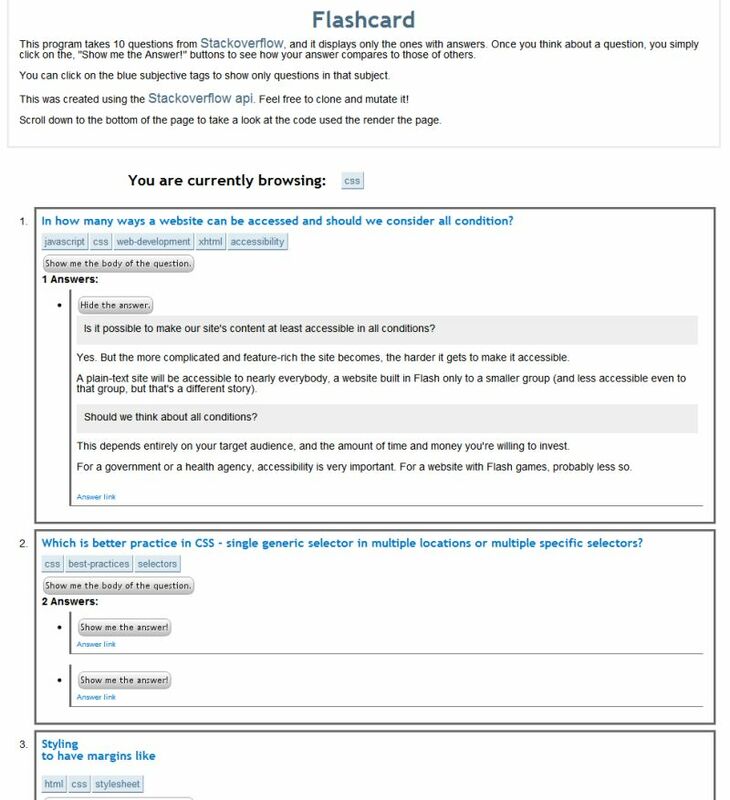 The idea is that you can look at questions on Stackoverflow without seeing the answers. Then, once you answer the question for yourself, you can reveal the answers by others. It's basically a fun trivia game. There's still a lot of things to add, but it is functional as is. I'd like to eventually add the up and down votes as well as comments for the questions and answers. Currently you can only browse the tags by clicking on tags or modifying the URL. I plan on adding a click based dropped down menu and text box. I'll also plan on making the loading of the initial questions by Ajax after the initial page load. Overall it's supposed to be a fun little game. Anyone can copy the code and modify it. I'd prefer you contact me if you want to work on the code, but you don't have to. I display the code at the bottom of the page, and I plan on putting it up on Github. You can download (copy / paste) the code from the page the app is running on. Peter Ajtai - hello @ the domain the app is on. PHP, jQuery, HTML, and CSS If you want to contribute let me know (preferred), or just copy the code and run with it. I'll probably put the code up on Github soon, but it's available on the app page itself. Browse other questions tagged app website php .